Last-Resort Antibiotics In Jeopardy As Use Rises Globally : Goats and Soda Antibiotic sales in clinics and pharmacies around the world rose by more than a third over a decade. Now drugs reserved for the most dangerous bacteria are at risk of losing their effectiveness. 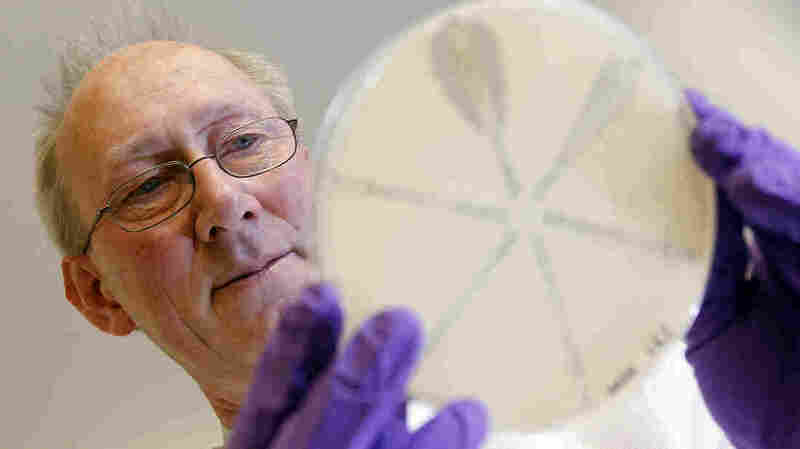 David Livermore, the director of the Antibiotic Resistance Monitoring and Reference Laboratory in London, studies a new class of superbugs, called carbapenem-resistant Enterobacteriaceae, or CRE. The total doses of antibiotics sold in clinics and pharmacies around the world rose 36 percent from 2000 to 2010, scientists reported Wednesday. The finding, published in The Lancet Infectious Disease, comes from the first study to look at global antibiotic consumption in the 21st century. And it seems like good news, right? "More people in poor countries are getting livesaving drugs," says the study's lead author, Ramanan Laxminarayan, who directs the Center for Disease Dynamics, Economics & Policy. "That's absolutely good news." But the world's insatiable need for penicillin and Cipro also has a dark side: the rise in drug-resistant bacteria. Now, even the last-resort antibiotics — the ones that are used after all others fail — are in jeopardy of losing their effectiveness, Laxminarayan says. "The concern is that the consumption of last-resort drugs has also gone up significantly since 2001," he says. "If drug resistance develops to these antibiotics, we have nothing else left to use." Over the past decade, bacteria have evolved to evade nearly every type of antibiotic. Most of us are familiar with MRSA (methicillin-resistant Staphylococcus aureus), which causes deadly skin infections. But there's also a superbug version of gonorrhea, and a vicious gut pathogen, called carbapenem-resistant Enterobacteriaceae, or CRE, which may kill up to 50 percent of people it infects. Doctors still have a few potent weapons against these pathogens, such as cephalosporins for gonorrhea and polymixins for CRE. But to keep these antibiotics effective, we need to make sure their use is limited. "These are second- and third-line drugs that need to be used carefully," Laxminarayan says. "Unfortunately, there's not a lot of guidance for how these drugs are being used." The current study found that three-quarters of the increase in antibiotic consumption occurred in Brazil, Russia, India, China and South Africa — countries where most people have incomes high enough to buy the drugs. Last-resort antibiotics are available over-the-counter throughout these nations. Even when a doctor is required to give a prescription, there's no guarantee the drug is being used appropriately, Laxminarayan says. "There's really no evidence that physicians are better gatekeepers of antibiotics than pharmacists." Laxminarayan and his colleagues analyzed pharmaceutical sales of 16 antibiotics in 71 countries over the 10-year period. Overall, India and China are now the two largest consumers of the antibiotics for human use. The U.S. isn't far behind, in third place. And the U.S. still has the highest per capita use in the world. The study couldn't tease out the cases in which the drugs were taken appropriately to treat bacterial infections from the times when they were wrongly prescribed for viruses or other types of infections. And the study didn't look at the use of antibiotics on farms. So the estimates are only minimum values. "There's potentially a massive increase on farms, and we have no idea what's going on there," Laxminarayan says. "We're working on a study about that now. But it's too soon to say anything." "Antibiotics are a natural resource, just like fossil fuels," Laxminarayan says. "As we run out, finding new ones will be hard and expensive. Penicillin costs pennies. Newer antibiotics may cost hundreds or even thousands of dollars."